I am born in an Agraharam in Dharmapuri (Karim Nagar district and one km away from Godavari river) into a family of orthodox Brahmins. I am brought up in BHEL, Hyderabad right from KG (Kindergarten) to PG (post graduation in MBA). May father has worked as a Telugu master. Due to my father’s profession, I have got introduced to the world of literature. I used to be an avid reader. If I have become a good writer in films, it is because of my father. My father is also a huge fan of films. He used to watch and take us to the films of Amitab Bachchan and NTR. BHEL used to have 6 schools. There used to be 5 English medium schools and one Telugu medium school. I belonged to Telugu medium. I used to take part in cultural activities and competitions. During my +2, there used to be drama companies called ‘Seeta Nilayam’ and ‘Lalitha Kala Mandiram’. I used to tour entire Andhra Pradesh and participate in drama competitions through those companies. I used to act as child artist, supporting actor and main lead till certain age. When I become adolescent I realised that I should get into backstage and writing. I used to be there at BHEL community center all the time. I learnt about dialogues, modulation, diction, dialect etc from senior BHEL stage artists like Mohan Rao, Bhujanga Rao, Srinivas and Naga Mohan. Though I am born in Telangana and brought up in Hyderabad, I have complete grip on all dialects and slang of Andhra Pradesh because I toured entire AP and learnt a lot about dialects. BHEL had employees coming from all parts of AP. A writer told me that ‘TV is smaller than life, Cinema is larger than life. But, Stage is just like life.’ I got addicted to stage a lot. Mr. Srinivas, who is an IIM alumnus suggested me that I should go beyond BHEL and try for NSD (National School of Drama). I got trained rigorously for NSD exams and cleared the prelims. The main interview was done by the likes of Girish Karnad and Charu Hassan. They opined that I am hyper and might not suit stage acting as it needs subtle performance. They asked me to go for films as my style suits movies. I have a lot of fascination towards NSD because it has produced legendary actors like Nasiruddin Shah, Sharukh Khan and Shabna Azmi. I wanted to have the experience of NSD, hence I attended at work shop conducted by NSD. I have decided to enter films. EVV Satyanarayana used to have a team of 10 writers for each of his films and he used to encourage writers a lot. I tried to join EVV through many of his writers, but nobody trusted me because I was just graduate. Uday is my best friend who used to work in Sumanth Arts as associate director. He introduced me to S Gopal Reddy (Durga Arts) who was planning Ninne Ista Paddanu at that time. I worked in story department and was assistant director for that movie. I got introduced to Kona Venkat at that time. It was Kona Venkat who brought me my second project Veede (Ravi Teja). I was the one who narrated the entire script of Veede to Ravi Teja. Since then, I started having a good rapport with Ravi Teja. I worked as an associate to Veede film. It was a wonderful experience to work with Raviraja Pinisetti. I got confidence that I was capable of directing a film by working with Ravi Raja. After working for 20 days of shoot, Raviraja Pinisetti got confident about me and used to give trivial shooting work. It was a thrill to say ‘action and cut’. I had never seen a director like Raviraja who has such a command on his work. Then I was appointed as a co-director for Autograph film. During the shooting of Autograph film in Kerala, we had to cross a river by boat every day. Ravi Teja used to get bored during that time and asked me to narrate any story. Ravi Teja liked the story. It was Mass Maharaj Ravi Teja who recognised the director in me for the first time. After the shooting of Autograph was complete, I started doing a bound script for Ravi Teja. At that time Ram Gopal Varma was planning to produce a film with Ravi Teja in the direction of Prawaal Raman (Darna Mana Hain fame) in Telugu. Jyotika was also signed as heroine by then. Since Prawaal Raman was a Hindi guy, Ravi Teja wanted a Telugu guy in direction department. He suggested my name as a co-director to Ram Gopal Varma. We (me and Kona Venkat) went to Mumbai to listen to the story. I went to RGV's factory office and I was floored after looking at such an ambiance. RGV was doing the post-production of Sarkar then. RGV gave the best narration I ever heard in my life. It was like a perfect Hollywood script with a bit of darkness to it. I told RGV that the script is very good, but won't suit Ravi teja. RGV told me - ‘you came from Hyderabad after assisting a couple of films and passing judgment on my story like a pundit. But I like your guts because you spoke frankly without trying to be a sycophant. Since you worked with Ravi Teja and know what works for him, I am willing to offer you a direction chance’. He gave me a shock with that unexpected directorial offer. Kona suggested me to sign that project as getting first project is not easy. I accepted the offer. RGV wanted a Telugu film without songs. I told him that it was RGV who had beautiful songs in films like Shiva and Rangeela with great music directors like Ilayaraja and AR Rahman. And argued that why shouldn’t I have songs. Just like I take credit for the success of Gabbar Singh, I am also take the complete credit for the flop of Shock. RGV gave me free hand over the script. He never visited sets or suggested anything during post-production. RGV is never responsible for the failure of Shock film. I started getting condolence messages and sympathies from all the people around for the failure of Shock film. That is when MS Raju spotted me. MS Raju is known for spotting flop directors and delivering commercial blockbusters with them. He offered me an attractive package. But I had creative differences with him during the development stage. I didn’t want to make the mistake I did with my first film. I opted out of the project though I was financially desperate at that time. That is when Puri Jagan came to my rescue. He said that he has gone through similar phase in his career too. He has offered me a job in his writing department for Chiruta that launched Ram Charan. Then I continued working for Bujjigadu as well. It was like getting trained as well as getting paid. 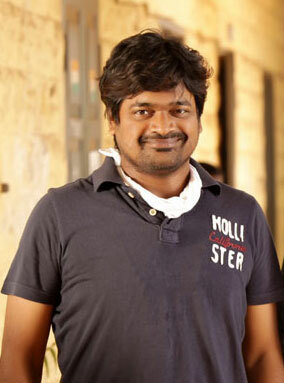 My perception towards commercial cinema changed during the days of my working with Puri Jagan. Then the direction bug started itching me again. I was like a girl who acted as a heroine in one film and then joined as a touch-up artist for a top heroine. It was NTR who was the first hero to listen to my script after the release of Shock. That film’s name was MLA and he was excited with the project and a press release was sent. But due to certain external factors, that film was got shelved. It was Bandla Ganesh who took me to Pawan Kalyan. It was the script of Mirapakai. After listening to interval episode, Pawan Kalyan gave me a go-ahead. But that project didn’t materialise due to certain reasons. It was Ravi Teja who gave me birth and rebirth as a director. During the shooting time of Shock he said that he would do another film with me irrespective of the commercial outcome of Shock. I was feeling guilty all this while and didn’t approach him. He called me and asked me for a story. Then I narrated the script of Mirapakai. Mirapakai was made and released. The rest as they say is history!